The Cassini spacecraft has observed geysers erupting on Saturn's moon Enceladus since 2005, but the process that drives and sustains these eruptions has remained a mystery. 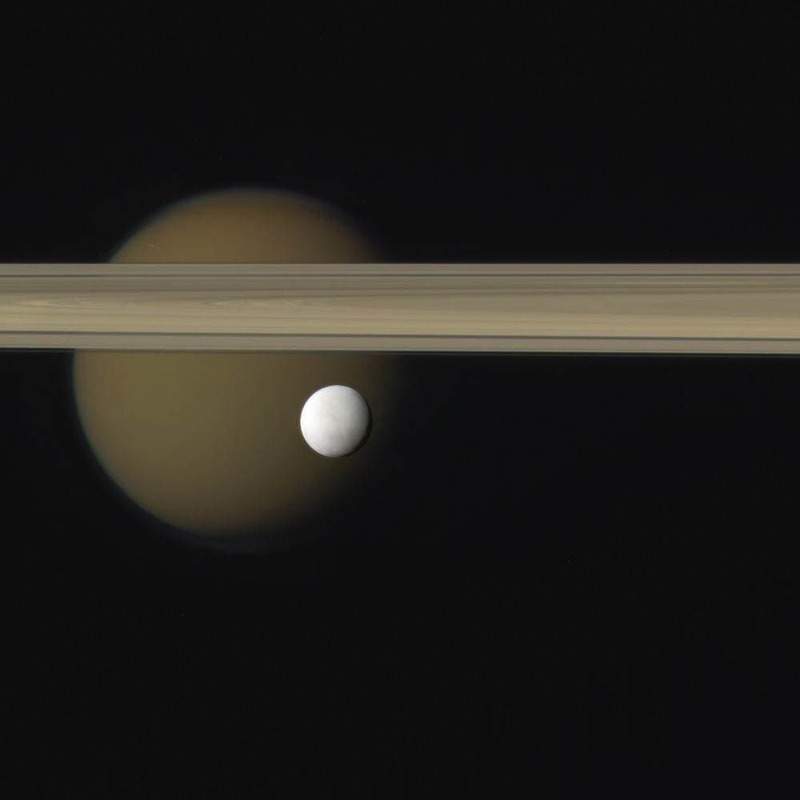 Now, scientists at the University of Chicago and Princeton University have pinpointed a mechanism by which cyclical tidal stresses exerted by Saturn can drive Enceladus's long-lived eruptions. "On Earth, eruptions don't tend to continue for long," said Edwin Kite, assistant professor of geophysical sciences at UChicago. "When you do see eruptions that continue for a long time, they'll be localized into a few pipe-like eruptions with wide spacing between them." But Enceladus, which probably has an ocean underlying its icy surface, has somehow managed to sprout multiple fissures along its south pole. These "tiger stripes" have been erupting vapor and tiny frost particles continuously along their entire length for decades and probably much longer. "It's a puzzle to explain why the fissure system doesn't clog up with its own frost," Kite said. "And it's a puzzle to explain why the energy removed from the water table by evaporative cooling doesn't just ice things over." What's needed is an energy source to balance the evaporative cooling. "We think the energy source is a new mechanism of tidal dissipation that had not been previously considered," Kite said. Kite and Princeton's Allan Rubin present their findings the week of March 28 in the Early edition of the Proceedings of the National Academy of Sciences. "I was very happy to see this new work by Kite and Rubin that brings to the fore a process that had escaped notice: the pumping of water in and out of the deep fractures of the south polar ice shell by tidal action," said Carolyn Porco, head of Cassini's imaging science team and a leading scientist in the study of Enceladus. Enceladus, which Kite calls "an opportunity for the best astrobiology experiment in the solar system," serves as a leading candidate for extraterrestrial life. 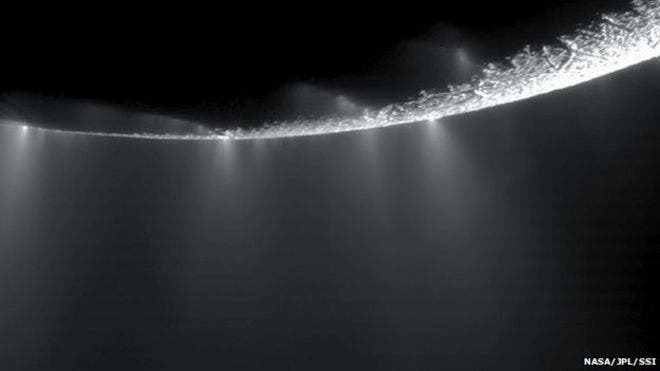 Cassini data have strongly indicated that the cryovolcanic plumes of Enceladus probably originate in a biomolecule-friendly oceanic environment. Cryovolcanism may also have shaped the surface of Europa, one of Jupiter's moons. "Europa's surface has many similarities to Enceladus's surface, and so I hope that this model will be useful for Europa as well," Kite said. One of the problems that attracted Kite and Rubin was the anomalous tidal response of the Enceladus eruptions. The eruptions reach their peak approximately five hours later than expected, even when taking into account the 40 minutes needed for the erupted particles to reach the altitude at which Cassini can detect them. Other scientists had previously suggested reasons for the lag, which included a delay in the eruptions as well as a squishy, slowly responding ice shell. "The new proposal is really a way to get a delay in the eruptions. You really don't need to propose any terribly squishy ice shell to do it," Porco said. Kite and Rubin also wanted to know why Enceladus maintains a base level of cryovolcanic activity, even when at that point in its orbit where the fissures should clamp shut and curtail the eruptions. Other key questions: Why does the volcanic system generate five gigawatts of power instead of a lot more or a lot less? Why don't the eruptions frost over or freeze over? 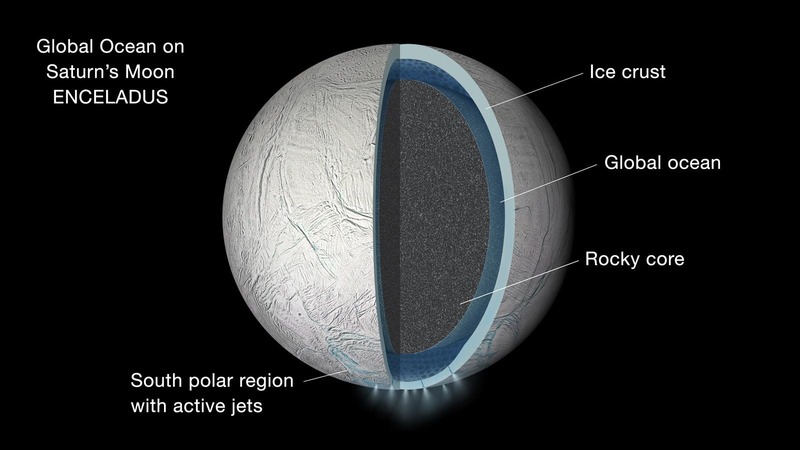 The Kite-Rubin model of the Enceladus plumbing system seems to answer them all. Their model consists of a series of nearly parallel, vertical slots that reach from the surface down to the water below. They applied Saturn's tidal stresses to their model on a desktop computer and watched what happened. "The only tricky part quantitatively is calculating the elastic interactions between the different slots and the varying water level within each slot as a response to the tidal stress," Kite explained. The width of the slots affects how quickly they can respond to the tidal forces. With wide slots, the eruptions respond quickly to tidal forcing. With narrow slots, the eruptions occur eight hours after the tidal forces reach their peak. "In between there's a sweet spot," Kite said, where tidal forces turn water motion into heat, generating enough power to produce eruptions that match the observed five-hour lag. Porco called it "the best thing in my mind about this new work." Tidal pumping heats the water and the ice shell via turbulence. Kite and Rubin have proposed that new Cassini data can test this idea by revealing whether or not the ice shell in the south polar region is warm. "If the new mechanism is a major contributor to the heat coming from the fractures, then the south polar ice in between the fractures may in fact be cold," Porco said. "The jury is still on out on this until the results from the final Enceladus flybys of last year are fully analyzed." "In that crack you have strong tidal flow, so it would be interesting to see what a real ice sheet does in an environment that's analogous in terms of the amplitude of the stresses and the temperatures of the ice," Kite said.